Volumes have been written on Gandhi and Indian National Congress. There are diverse views about both. The views on them depend on the ideology of the person giving these views. To add to the prevailing views, recently (June 2017), the BJP President Mr. Amit Shah called Gandhi as a Chatur (Shrewd) baniya (trader caste). With this characterization of Gandhi Amit Shah joins the illustrious company of Jinnah who also called Gandhi as baniya, the caste of his birth. As such Gandhi had overcome the caste of his birth through his thinking and actions. When asked by a magistrate in Court in 1922 as to what is his caste Gandhi said he is a farmer and a weaver. While theoretically he stuck to Varnashram Dharma, the ideological foundation of caste system, in practice he overcame it by violating all the caste taboos, by relating to people of all castes, by insisting on an untouchable family staying in his Sabarmati Ashram, by himself staying in Bhangi (untouchable) colony in Delhi and by himself taking up manual scavenging. The other point Amit Shah made was about the nature of Congress. As per him “Congress party… was constituted as a club by a British man. It was later converted into an organization engaged in freedom struggle…” He also presents Congress as a loose body bereft of any ideological commitment except that of anti colonialism. Both these formulations of his are superficial and distorted presentation of the complexity of the origin and struggles of this party which lead the national movement. With the British introducing modern transport, modern education and industrialization the society started transforming quickly and newer social classes, Industrialists, industrial workers and modern educated classes started coming up. These groups gradually could see that British policies are aimed at enriching England at the cost of this land; they also could see that adequate facilities which can enhance the potential of this land are not being promoted. This led the formation of many organizations, like Dadabhoy Naworji’s East India Association,(1866), Anand Mohan and Surendra Mohan Bose’s Indian Association (1876), Justice Ranade’s Pune Sarvajanik Sabha 1870, and Viraraghavachari’s Madras Mahajan Sabha (1884). It is these organizations which felt the need for an all India organization. At the same time Lord O.A. Hume, who was a British officer also thought of an all India organization for Indians. Many feel that he was keen to provide a ‘safety valve’ for letting off the anger of Indians. These emerging organizations representing interests of emerging India; cooperated with Hume in the formation of Congress with a clear calculation of avoiding the hostility of the British and at the same time to generate a platform which could intensify Indian National consciousness for political and economic enhancement. As per historian of modern India, Bipan Chandra, Indian nationalists in a way used Hume as a lightening conductor by using this as a platform for emerging India. The National movement was based on aspirations of the rising classes while the roots of communal organizations lay in the declining sections of landlords and Raja-Nawabs. So rather than just being the fantasy of the British officer as Mr. Shah will make us believe; Hume’s initiative was the best option for Indian nationalists to express their political ambitions. The national movement, in practice, was being founded on the grounds of Liberty, Equality and Fraternity. In the process we see people of all religions, castes and regions overwhelmingly associating with this organization. Rather than an organization bereft of principles, as Amit Shah states the national movement and the Congress were firmly rooted in Indian nationalism, secularism and democracy. It is true that Hindu communalists (the predecessors of Mr. Shah) and Muslim Communalists (Jinnah and Company) were allowed in the party till 1934, after that Congress did take a decision to keep out the likes of Shahs and Jinnah’s. It is also true that some mild communal elements continued to be in the Congress but their prominent ideology was Indian nationalism. The national movement focuses on arousal of national feeling. This was in contrast to the sectarian feeling aroused by Muslim League and Hindu Mahasabha-RSS. National movement was strongly critical of economic policies of British economic policies, which were keeping the country poor. The proactive part of this movement led by INC was to unite the nation, cutting across the boundaries of religion, region and caste. It is interesting that while INC united most of the Hindus and Muslims bringing them into the national movement, Muslim League associated only with Muslims and Hindu Mahasabha and RSS united section of Hindus. It is another matter that majority of Hindus and Muslims became part of the national movement, bypassing the communal organizations. National movement also addressed the major issues of social reforms. 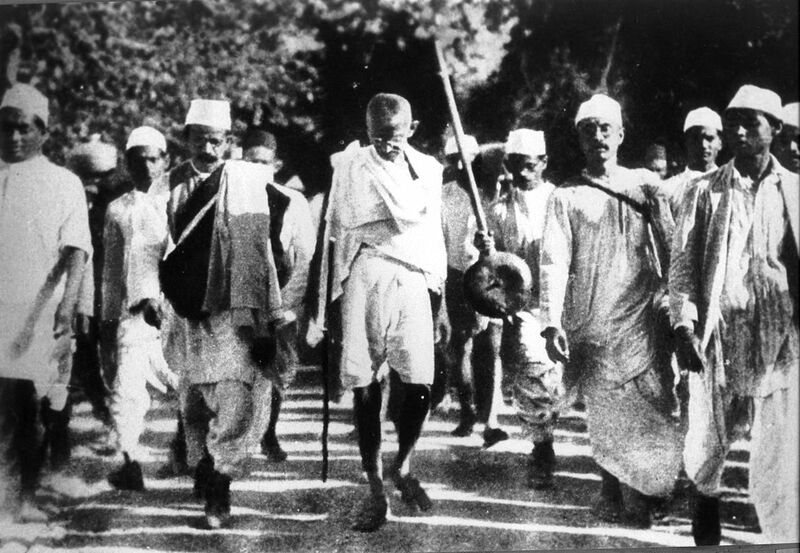 Gandhi’s campaign against untouchability shook the very foundations of caste based practices in a sense. While the struggles for these issues were within the framework of colonial system to begin with, later this assumed the form of anti colonial movement. National movement led by Gandhi-Congress so the orocess was called ‘India is a Nation in the making’. This was in contrast to the Muslim League’s assertion that ‘we are a Muslim Nation since the time of Mohammad bin Kasim and assertion of Hindu Mahasabha-RSS that ‘we are a Hindu nation since times immemorial’. As such what Amit Shah is saying is continuation of the Hindu nationalist’s hatred for Gandhi and Indian nationalist movement. They hold Gandhi as responsible for emboldening Muslims and weakening Hindu nation and partition of the country. It was their formulation and hatred for Mahatma, which led one of them, Nathuram Godse, to murder him. This hatred was expressed in RSS distributing sweets after Gandhi murder. (Letter of Sardar Patel, September 11, 1948).Today for electoral reasons they cannot speak the language of Godse so openly, still to oppose the Indian nationalism, they have been giving pinpricks like this one to undermine the Indian nationalism and the process of caste transformation which accompanied the freedom movement.